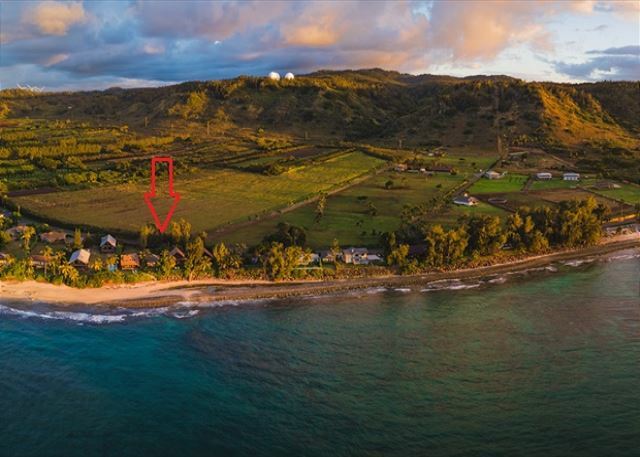 Live your dream in paradise as you wake to the sound of the Pacific Ocean at your doorstep in this 3-bedroom 3-bath beach front home. One of four beachfront homes ideal for family reunions or small weddings. Have breakfast on your large living room lanai, or on the private lanai off the master suite on the second floor. Master Suite includes modern bath with ocean views. The upstairs sleeping loft includes a full bathroom. Your Hawaiian hale (home) also includes a spacious living room, fully equipped open kitchen, dining area, two bedrooms (1 king, 2 twins) and a full bath with tub/shower on the ground floor. All 3 bedrooms and sleeping loft have AC. The Master Suite is located on the ocean side of the second floor. It features panoramic ocean views, a private lanai (balcony), Air Conditioning, a spacious bathroom with a soaker tub with ocean views and a queen size bed. In addition, the second floor features a sleeping loft with two twin beds, a/c and a full bathroom. This home includes an outside Hot/Cold enclosed shower, free WI-FI Internet access, cable sports channels and HI-Def Smart Flat Screen TV. 57-501, on the right/east, and 57-503, on the left/west, have identical floor plans. Fire up the grill and sip your evening drink as you view spectacular sunsets from your outdoor dining area. 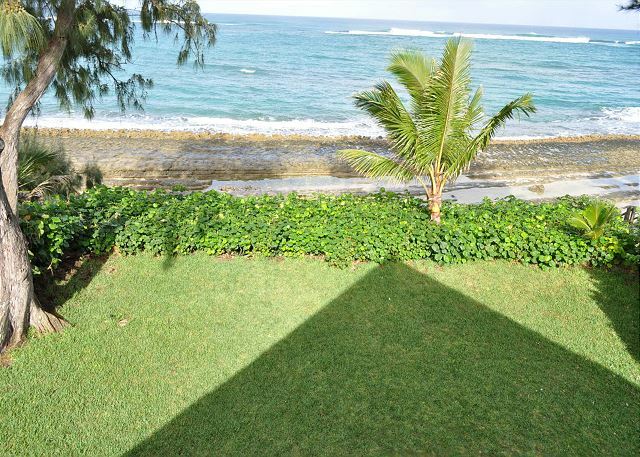 Step down from your deck to a generous lawn area overlooking the beach. 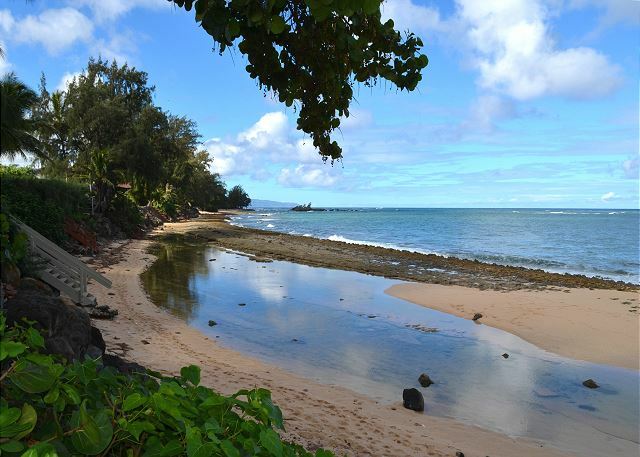 Take stairs down to the small sandy beach with reef and tide pools to explore; walk east 100 yards to the rightand find a swimming area and keyhole opening to the ocean; continue walking east another 100 yards to the west end of beautiful Kawela Bay. 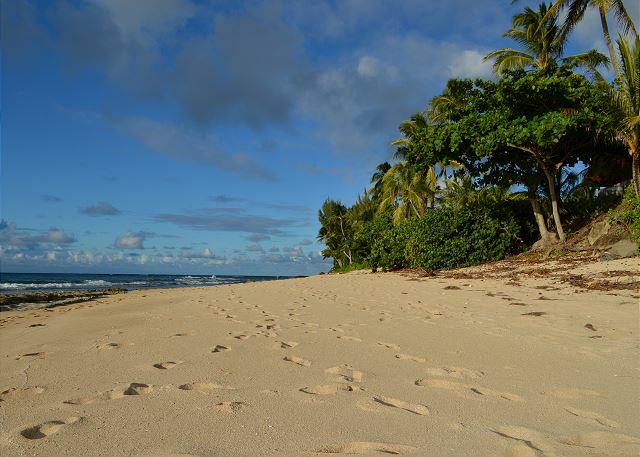 You won’t forget your experience on the North Shore with stunning ocean views; watching whales and giant surf in the winter, swimming and snorkeling in the summer, and soaking in beautiful sunsets year-round. Conveniently located. 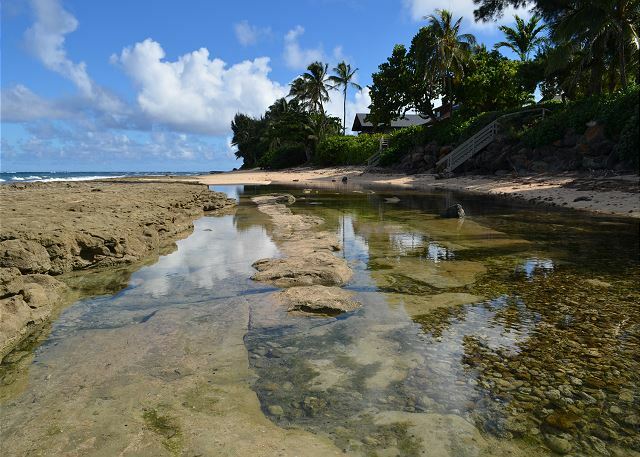 A short drive to the east; Kawela Bay, Turtle Bay Resort (golf, restaurants, eco tours, swimming), Kahuku Town (9 hole beachfront public golf course, Food Trucks), Malaekahana Bay (swimming, shoreline walk, surfing), Polynesian Cultural Center and to the west Velzyland, Ted’s Bakery, Sunset--Pipeline (surfing), Shark's Cove & 3 Tables (snorkeling, Food Trucks), Waimea Bay (swim, dive rock, giant surf), Waimea Valley Falls and Cultural Park and historic Haleiwa Town. It was most important to us to have a home right on the beach and this VRBO is. A few steps down and we were in the tidal pools. The home itself was very spacious and comfortable for 4 adults and 2 children. We appreciated the covered deck and ate all our meals there, with some of us having coffee on the upstairs balcony. We could see and hear the ocean through the large windows and patio doors. Absolutely wonderful stay on North Shore! We were lucky enough to be the first people to stay in the newly remodeled building! Everything was wonderful. The owners were very informative and very kind. The view from the master suite cannot be beat at this price. As other reviewers have mentioned, my wife had some bug bites on her legs. This isn't because of bed bugs, so stop that ****. 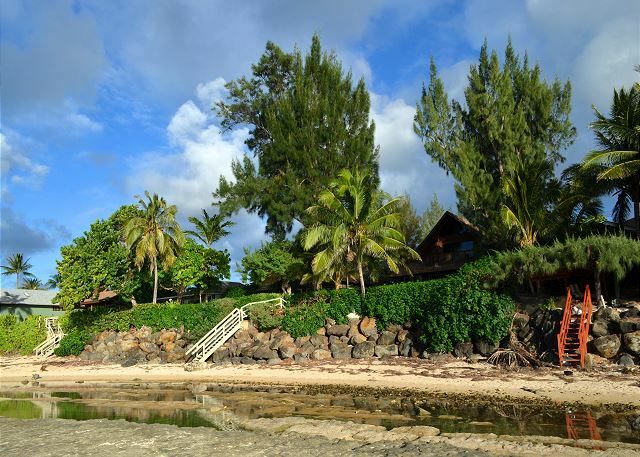 This property lies next to a reef. When the tide is lower, the reef makes a standing pool of water. Mosquitoes are to blame for the bites, NOT bed bugs. It was only one time regardless. A+ stay! Hope we can get it again if we go back to Oahu! Set up perfectly for my brother's family first time to Hawaii. They mainly wanted beach time, so achieve that easily. Easy access to Poly Cult Center, and Waimea Valley area. Property in great location, well presented and suitable for family holiday. Fridge was problematic lots of condensation forming on top and shelves to point of dripping water, obviously a long standing problem as note inside on taped control instructing not to move controls. Windows and blinds in downstairs bedrooms in very poor condition, windows difficult to open and blinds hard to adjust in any way. New deck at back a wonderful space but outdoor furniture provided scratched surface at slightest movement, which was disturbing as we tried to maintain as new surface. We had the absolute best stay. Our friends and family rented out the other 3 houses on the property and we all had an amazing experience. With the ocean as your backyard, there’s nothing you can complain about! Team realestate we’re extremely easy to book with and helpful throughout our entire stay. We can’t say enough about our time in the houses, and we can’t wait to come back! The view is amazing, access to beach right off the lot. House is very comfortable, but old inside. Clean but very dated. The upstairs very large room with balcony is amazing, morning views out over the ocean that are just fantastic. Was surprised that the king bed was in one of the rooms downstairs, the upstairs room has only a queen. Bathroom upstairs s cramped but very usable; downstairs is fine for shared between the two downstairs rooms. If you plan to cook, the equipment in the house is a bit challenging. Knives VERY dull. But kitchen work space excellent. Overall a great place, with a dated look and feel. The house was in an excellent location! Beach front, gorgeous views, sea turtles swimming and a natural swimming pool "keyhole" just a few houses down. The house is a bit older and with a few minor repairs/updates could be amazing! The views from the second floor balcony are beautiful but doors really need screens so that you can leave them open without bugs coming inside. Due to the bugs we had to keep the doors closed which made it incredibly hot and difficult to sleep. A few more pedestal fans throughout the entire house would have made a huge difference. We can't speak highly enough about Sophia from Team Real Estate, as she responded quickly to any concerns we reported, for ex: the stove handle came off and the handy man was scheduled immediately. We loved the outdoor shower, the deck and yard, although the deck needs some TLC. Additionally I would not suggest going over the 4th of July as it was SO busy and the traffic was a nightmare. The very next day traffic and tourists were gone. Unfortunately is was also the hottest week that they have had so far, which made it miserable in the house when there was no breeze. Highlights included Polynesian Cultural Center, Dole Plantation, Pearl Harbor, Aloha stadium swap meet and Ted's bakery is a must. Over the past 25 years we have rented over 25 homes on the Oregon coast and found this home to be good value for the money. We looked extensively and you are not going to find a beach front house for this price. I totally enjoyed my stay at Kawela Kai Nani 503. It feels like you are completely secluded, its like an escape to paradise. You have your own stairs leading you to the beach and your own outdoor shower area with hot water. Fishing, swimming, and a beautiful Sunset. I have stayed here in the past and I absolutely love it. This was the 2nd time we stayed at #503 and we enjoyed it just as much as the first time. We plan to return next year. Wonderful experience. Very nice ocean views. 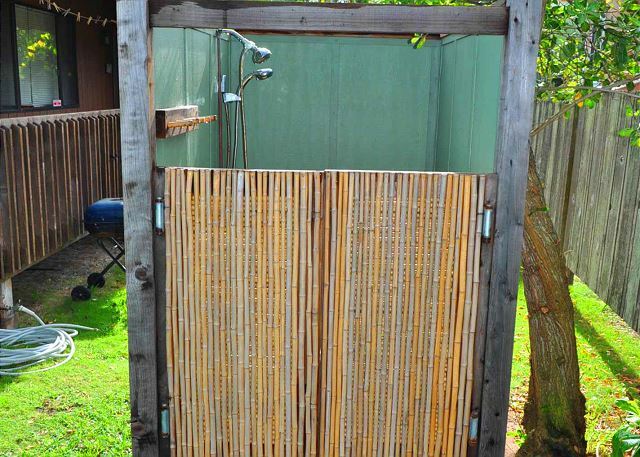 Loved the outdoor showers with hot water and high pressure showers. Great place to stay on vacation on the north shore. Lovely spot on the water peacefully and large. • Traffic noise from the road. We enjoyed our stay here. Great view, the sunsets was wonderful to watch the house, the sound of the ocean at night, it was perfect for us. If you're thinking about staying at a house on Oahu, stay here. We'll definitely be back. Absolutely wonderful. House was clean and well maintained. Natasha at Team Real Estate was very helpful answering all our questions. We strongly recommend KAM 503 as a vacation destination for the North Shore. This home could not have been more perfect. Our 3-generation family of 7 stayed here in absolute comfort. Each morning we were met by the crowing rooster, drove the short distance down the road to the famous Ted's bakery for pie, stopped at a fruit stand practically outside the gate, then walked on the beach to collect shells and swim. Though we were there during extreme tide and wave warnings, there were two protected swimming spots about 6 houses away in either direction. This house alone was an ideal set up, but the location would be even better for larger parties combining the properties. It is an hour's drive from Honolulu and Hanauma Bay, but having stayed in Waikiki in the past, this side of the island feels much closer to nature and less like a typical Americanized city. The house itself was in good condition. The furniture was excellent, the windows and screens were all new, wifi worked perfectly. Some of the fixtures and supplies could use updating (faucets, toilet seats, cookware), but everything worked fine. Our favorite thing was the private outdoor shower with hot water. It functioned as a third shower, which was handy with 7 people. We never turned on the tv or the air conditioner because the open windows and the ocean sounds were more than enough. I was leary about staying on the beach because I HATE sand in the house (we had a gritty vacation in San Diego where sand even ended up in the beds), but with the grass yard as a buffer, the outdoor shower, and carpeting in the bedrooms, sand never made it into the house at all. Because the property was gated from the main road, we left shoes outside and hung towels and suits on the clothesline overnight or while we were gone. The lanai truly functioned as an additional living space. If we return to Oahu, we would not consider staying anywhere else. This is the best property (for the price) you will find on the whole island. This is the first time I did a beach rental in Hawaii. The agency was always quick to respond and the owner was very nice and accommodating. My family had a very nice and relaxing time with all the comforts of home. Kawela kai was perfect for our family vacation. We all were so comfortable and extremely happy here. We had enough room for everyone to gather and enjoyed the dinners together, the beach walks ( careful for the rocks) and especially the sunsets! Love the location away from the traffic of the North Shore and all the roadside fruit stands. Turtle Bay Resort is so close to enjoy a nice sunset cocktail by the pool bar and live music to boot. Lei Lei's restaurant has amazing food and for the golfer in the group it's a putt away! We are already planning our next visit. Mahalo to Natasha at Team Real Estate for her kindness and Aloha. This house is better than described. We arrived to blue skies and fantastic ocean views. This house has so much room you can find your own space or spend time with the family on the verandah. There was noise from the cars on the highway but after Saturday night it wasn't that busy. The sound of the ocean negated the cars. The outdoor shower was the best. We all used it as the view was spectacular. The house has everything you require fir a fantastic Holliday. Loved it! We stayed at Kam 503 for a week, and had an amazing time. Great location, short drive to everything and amazing to have the water on your doorstep. My husband and I rented out all four houses for our beautiful wedding. Our family who stayed in the venue enjoyed this beautiful home. The property was well maintained and clean. We had a hard time opening and closing the door because the door was swollen. So just to be safe because we did not want to break it especially since it had a glass window in the middle of the door everyone had to exit and enter through the sliding doors. Although when it came to locking up we had to exit through the main door, which took us a good 10minutes to get the door open. 7 of us stayed in this lovely home for a week~it was exactly as described with a beautiful view of the ocean off the back deck. Natasha from Team Real Estate and owners Lucky and Marilyn were available and attentive to ensure our needs were met. We loved this home and were reluctant to leave! Great house located in the North Shore. We rented this property for one week in August 2014 to host all my family and we were absolutely delighted by the place, the incredible view and the quality of the equipement. We definitely recommend this property to anybody who want to enjoy Hawaii and more precisely North Shore. We thoroughly enjoyed our stay at KAM 503. There was plenty of room inside, and a big backyard with an amazing view of the beach and ocean. We had a wonderful view from the inside as well. It was fun to wake up each morning and gaze out at the ocean. The place was private and quiet. Best of all we were able to enjoy sunsets and whale watching from our deck, balcony, and backyard. I give this rental place 5 stars! I was satisfied with it all. Kathy Sanders helped with every aspect of my stay . She was great! We totally enjoyed staying at Kawela Kai Nani. It was the perfect getaway! The beach houses were located well past the busy North Shore beaches, but close enough to get to/from them. It was mostly quiet except for the roosters and the blaring mopeds on Saturday night (LOL!) It was all well worth waking up every morning to that incredible ocean view and seabreezes. The property and landscaping are maintained very well. Some furniture, fixtures, and the linens could be upgraded, but they worked fine for a beach house. I appreciated the upgraded electronics in the living room. 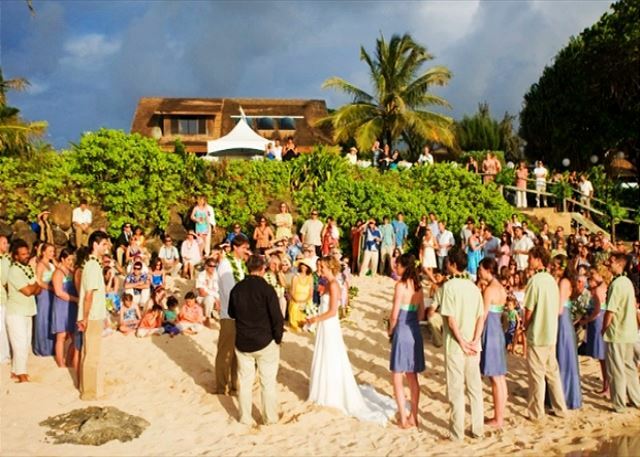 We rented all four houses to have our wedding on the beach and garden reception, and it was PERFECT! This was a perfect vacation rental for my out-of-town family who came to Hawaii for my wedding. It's an awesome house with amazing views! overall very nice, wonderful time. water toys provided. very comfortable. could use a cutting board and more glasses. we had 8 people, 4 adults and 4 kids. wasn't crowded at all. would recommend to a friend. Lovely place to stay on the North Shore. This was a very nice place to stay on the North Shore. The beach is right in the backyard. We loved the sound of the waves. We didn't like the sound of the traffic, however, which is also very close by. There is great cross breeze with all the windows open, but there is only air conditioning in one downstairs bedroom. There is cable T.V. with lots of channels, but when we tried to purchase a movie, we were blocked. Overall, this was a great place and we enjoyed our stay very much. Kam 503 was a great place! Great property, right on the beach, spacious house. Everyone enjoyed their stay. This was a wonderful home to stay in. We love staying on the northshore.